Colin Gray is a Podcaster and Online Educator, and has been teaching people how to podcast for over 6 years. Colin is passionate about helping people understand how to do a podcast. He works with individuals & businesses to helping them take advantage of the benefits podcasting can offer. Colin is a web developer by trade, creating websites and working on internet marketing and SEO for clients around the UK. He also does a lot of work in online education working part-time for a university in Scotland. His background in online education, has helped him put together comprehensive online podcasting courses, all designed to help people launch and grow their own podcast, and then enhance their shows as they develop. These days, Colin produces two Podcasts, one on Podcasting and the other based on his hobby Mountain Biking. PodCraft is the former, run on his website The Podcast Host, which is a season-based show which tackles Podcasting topics head-on over a series of shows, looking to create a definitive guide each time. Hello. I’m Jonathan. Thank you for joining me on the Easyspace.com blog interview. Colin Gray is a Podcaster and Online Educator, and has been teaching people how to podcast for over 6 years. Colin is passionate about helping people understand how to do a podcast. He works with individuals & businesses to help them take advantage of the benefits that podcasting can offer. Colin is a web developer by trade, creating websites and working on internet marketing and SEO for clients around the UK. He also does a lot of work in online education, working part-time for a university in Scotland. His background in online education has helped him put together comprehensive online podcasting courses, all designed to help people launch and grow their own podcast, and then enhance their shows as they develop. These days, Colin produces two Podcasts, one on podcasting and the other based on his hobby, Mountain Biking. PodCraft is the former, run on his website, ThePodcastHost.com, which is a season-based show which tackles podcasting topics over series of shows, looking to create a definitive guide each time. In this podcast interview, Colin explains what podcasting is, how he became involved in podcasting and tells us the benefits of having your own podcast and how you can start one. Colin, welcome to the EasySpace.com blog interview. Thank you for joining us. No problem at all. It’s an honour to be here. Q1. Colin, tell us a bit about your background and how you first became involved with making podcasts. Well it’s a long and meandering story, but I’ll try to keep it reasonably short. My original background is in web design. That’s what I started doing back in about 2004 or 2005-ish. I ended up in college teaching web design about a couple of years later – by 2007 or so. It was around there that I got into learning technology. So I got into creating online courses and teaching lecturers and college teachers how to basically create great courses on the internet. Part of my job there was learning about technologies that help people to teach. One of those of course, at the time, was podcasting. This was only about two years or so, three years maybe after podcasting had first started out. That was year 2007, 2008-ish. I was learning how to podcast, basically so that I could teach lecturers how to podcast for their classes. That kind of took me… really, I worked in higher education for another few years after that. I ran my own business for awhile after that. These days, I’ve transitioned into basically—I don’t do any higher education stuff anymore and just run a business around teaching podcasting. Now it’s not just lecturers; but it’s businesses, it’s individuals just doing it as a hobby, it’s anyone really. But it all started out through learning how to do it myself so I could teach others. Q2. For anybody listening that doesn’t actually know what a podcast is, can you briefly explain what a podcast is? Yes. My go-to definition is always it’s just talk radio on demand. You imagine the talk radio shows that you get on (if you’re in the UK) Radio 4 or whatever, it’s just a half-hour talk show on a certain subject, but you can actually just download them. You can subscribe, and then they come to your mobile device any time. That’s kind of what defines a podcast as opposed to just an audio file. It’s a file that you can subscribe to it. You’ve got a podcast app on your phone or your computer. You subscribe to the show within that application, and then all of the new episodes come to you as and when they’re released. Q3. Tell us about your website, ThePodcastHost.com. Why did you start and how does it help people? That was part of my work with the university all those years ago. Back in about 2009, I think, I started that – around in anyway. It was really actually just as a solution to something we were having trouble with. One of the things you have to do when you start a podcast is have somewhere to put it on the web of course so that people can actually access the audio files, and a lot of the podcast hosts at the time (I’m talking about a host as in hosting the files in the internet, as opposed to a person who hosts the show, the podcast hosting companies), they were a little bit fledgling at the time, probably not as reliable as they could be. Quite a few of the ones that we tried out just didn’t really have a great service. It’s all changed these days as some great ones are out now, but back then, I decided to set up the site just so I could actually host some of the shows that we were creating at the university. That was the original point of The Podcast Host. It was a hosting a company to host the files. These days though, I don’t actually do hosting in terms of the files at all. It now refers to the podcast host as in the host of the show. Really, it’s aimed at making you the best host you can be for our shows. It has lots of articles on it around presentation skills, around how to design your podcast, around planning it, around equipment to use for your podcast, like microphones and mixers. It’s basically a site designed to help anyone enter podcasting. These days as well, we do courses. 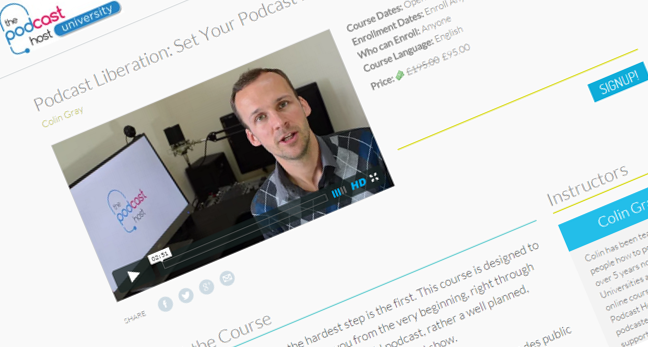 I’ve got a course called Podcast Liberation, which helps you launch your show from start to finish and also one on creating a podcast website. If you want to actually create your own site, self-host it using WordPress, then you can go in there, and you can learn how to create one yourself so that you’ve got a site that’s really effective in letting people listen to your show and turning them into subscribers. Q4. Why would anyone want to do a podcast? For example, a business, what’s the benefit of having a podcast? There’s a few things that podcasts do pretty much about anything else. I know I’m biased, but actually, there’s a bit of fair research and a lot of anecdotal evidence around it. The first of which is just engagement. When you’re listening to a podcast (compare it to reading a blog post or watching a video) when you’re listening to a podcast, you are hearing the person speak. You’re hearing their personality. A voice just gives over so much more personality and transparency than if you’re reading a written word. Comparable to an article, you just get so much more self-engagement with the audience because they get to know you. They feel it, and they know you. People who host podcasts tell me stories about how their listeners come up to them when they actually meet them in person and say, “Oh, I know you so well. I’ve heard about your family. I’ve heard about your dog, your hobbies, all those kind of stuff because you tend to talk about that kind of thing in your podcast.” That’s possibly the type of thing you wouldn’t put in a written article as well. That increased transparency that comes across in a podcast along with your voice just makes for much more loyal listener and loyal fans than somebody who would just be reading articles. The other thing is that, comparing it to a video now, a podcast just gets so much more attention. Podcasts are most often listened to in places where you might be wasting time otherwise. Say in the car, that’s quite a common one. People will be driving to work, so you’ve got a half hour commute to work. You can actually listen to a podcast. You can listen to a show over that half hour and then maybe a half hour home as well. Or if you go for a walk, or you’re doing some gardening for an hour, or you’re cleaning the house or doing the dishes, or whatever. There’s all these things that you would be doing anyway, but actually, you can set your earphones on. You don’t have to think about the activity. You listen to the show, and you learn something, or you’re entertained, or whatever, during that time. Because you’re doing it in those contexts, it means that you’re listening to the shows for so much longer. You get podcast episodes that are half an hour or an hour. Some of them even go two or three hours long, and people listen to them. Whereas if you’ve got an article in the web that you’re reading, you’re only going to spend a few minutes on that. If you’ve got a video, people talk about attention span for a video is being in the minutes, like 3 to 6 minutes or so. You’re lucky if you can get somebody to watch a video in the web for more than 10 minutes. So you’ve got people listening to your voice, listening to your message for half an hour, an hour, or two hours. It’s something that just doesn’t happen with any other medium. That self-engagement, that attention, both of them come together to really make this a medium that is so good for businesses because they can get their message out. They provide some value, they generate these really engaged fans, they’ll just listen to them for hours on end and just become really connected to the brand and much more likely to then buy into the brand, to buy the products that the brand sells, and to promote that brand to their friends. Q5. If somebody wanted to do a podcast themselves, what are the basic steps they need to follow to do that? What equipment or software would you recommend people start with? It’s always good fun when that comes up because I love— Part of the reason I got into podcasting is I’m an equipment geek. I love playing around with gadgets, and I love new microphones and all that kind of stuff, and playing around with software, and testing it, new stuff like that. The great thing about podcasting is that, actually, you don’t really need to know any of that stuff. You don’t really need to be technical. You don’t really need to know about creating websites, any of that kind of thing. It’s actually really simple these days. The way I usually get people into podcasting is to recommend that they start out with just buying themselves a reasonably good headset microphone, something like—there’s one called the Sennheiser PC 8. That just goes on your head. You get a little microphone down the side of your face. The advantages are that it’s really simple. It’s USB. It plugs in to your computer. It’ll just work. There’s no set up required. There’s no knowledge about how to set up a mixer, a microphone, all this kind of stuff required. There’s barely even any software required too. I’ll get to that in a second. The other advantage is that because it’s a headset, it’s just always in the right place as well. The trouble with more professional microphones, the more expensive microphones is you need to know how to use them. You need to know there’s a distance away you need to be. You need to hold them. You need to be aware of how you’re speaking into the more expensive microphones, but a headset mic gets around that. It’s just always in the right place. For software, once you plug in that headset, it should just work with your PC or your Mac, and then you can download something called Audacity. Audacity is an audio recording piece of software which is free to get. It’s amazing it’s free, because it’s really powerful. All you do is open up Audacity. If you’ve already got your microphone plugged in before you open Audacity, it should pick that up by default, but there’s one little dropdown that lets you choose the microphone if not. All you do is hit the record button. There’s a big, red record button there. When you press that, it starts recording. You just start speaking, and that’s it. You essentially just export that audio file, and you actually get your first podcast episode. I always say in the first 10 episodes not to worry too much about editing at all either. If you make mistakes, just keep going. Just say, “Oh, I don’t mean to say that,” or, “Oh, sorry. That’s not what I meant. I’ll say this instead.” Nobody really expects you to be perfect on your podcast. So actually, you can just make it nice and easy. Just keep everything very simple for your first 10 episodes and actually just get some practice, and see how you find it. If you find that you’re actually getting some listeners by that point, by the 10th episode, then you can get some feedback from them. You can find out what the listeners like. You can find out what’s good or what’s bad. You can refine it. You can buy some extra equipment then if you like, if you think you’re going to be able to do it for the long haul. Q6. In your opinion, what makes a good podcast? A good podcast… There’s a few factors go into it…. The first one is the fact that you’re actually really interested in the subject. I sometimes get wound up about this that some people say that passion is all you need to create even a business (never mind a podcast), that passion is all you need to create a podcast. It’s not true. I’ll go into the other things as well. Passion is one requirement. You do need to be really interested. You do need to be really into your subject, know it inside out, really live and breathe that subject. That passion comes across. I was talking about the engagement earlier on. That engagement comes when you obviously are so into your subject that you carry that passion across to your listener. That’s the first thing. I mean it’s unlikely you’re going to do a podcast about something that bores you anyway. That’s probably a given – unless of course you’re doing one for a business (if it’s your job or whatever). Maybe if you’re going to do a podcast about something that doesn’t really excite you (if it’s your job and it’s part of your job, it doesn’t excite you), maybe you have to find ways to speak about that subject or aspect of that subject, or maybe some way of inciting this excitement you need in it. Anyway, that’s the first thing – passion for it. Some people think the next thing is equipment. Some people think the next thing is quality, but I think the next thing is content and the practice – being a good presenter. The next thing is actually getting some practice. It’s actually recording 10, 20 episodes, starting to plan out content, actually starting to learn how to tell a story throughout an episode. Over 20 minutes of an episode, how you talk through a subject and how you tell that narrative: what order are you going to do it all in, how you sort of teach that, the way that you relay all of that information. That takes practice. That takes planning. That takes actually creating 10 to 20 episodes, getting feedback from people, and finding out which ones people like and which ones people don’t like. Presentation skills are actually really important. A lot of people sort of neglect that part. They jump straight into getting really good kit. Third actually equipment does get into. You need to make sure that you’re listenable. 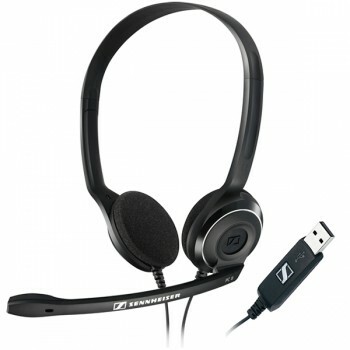 You do need to get a semi-decent equipment, such as the Sennheiser headset. That headset’s pretty good, but it only costs you £20 – £30. There’s sort of minimum levels that you need to make sure that it’s a good show. There’s three things together: the passion and the knowledge of the subject, the planning and the practice of the presentation skills, and then the equipment as well. The final thing actually is just knowing exactly what you want to create with the podcast – you having your own aims as well, you having your own structure and having a really good, solid plan for what the podcast is about so that people come to the podcast, they know what they’re getting. They subscribe to it knowing that this is what the podcast is about, this is what the podcast is going to talk about every week, and you’re not going to change that, you’re not going to start talking about something else one week and totally go off on a tangent on a different subject. You have a plan, you have your aims, and you know what you’re going to be talking about. You stay on point. You stay on that subject every single episode and give the listeners what they want. Q7. You have taught lots of people how to start their podcast, and you’ve also advised people on how to grow their podcast audience. What are the basic things people need to do to grow their audience? Once they’ve first set it up and they know how to do a podcast, what about actually growing their audience and increasing the popularity of the podcast? What are the basic steps they would need to take to do that? Yes, sure. It’s always the big question. Once people get started, they need to know how to grow their audience. They always want to know how to grow their audience. There’s no simple steps to it. There’s no tricks. It’s not like the old days of Google and SEO and stuff like that where there were certain tactics you can use to grow. The first thing is following all those last steps: making sure that you content is really good, making sure that your presentation skills are really good, so that in the first place, the show itself is worth sharing, so that when people listen to it, they become a fanatical fan, and therefore they share it with their friends. The next part though is actually something that people forget, and that’s actually asking for that favour. It’s actually going on the show, and once you’ve got that audience, once you’re 20 – 30 episodes in, you’ve got your few hundred listeners, you actually ask them every episode to do something for you. Ask them to share it. Actually just asking your audience for that favour. People that enjoy what you do, if you’re putting out good content, are more than willing to do that. The next part is being more visible I suppose in the search. We talked about search a minute ago. iTunes really is our search engine of choice. That’s where most people find podcasts. The good thing is that even thought that’s not everywhere that they find it, the stuff that works on iTunes works pretty much everywhere. What you want to be doing is making sure that the keywords for your subject are in the title of the show. 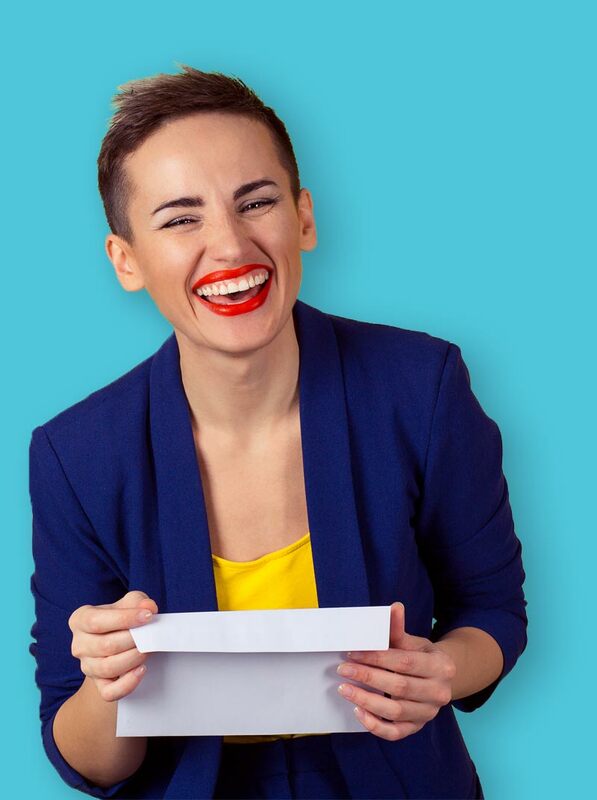 Maybe if the name of your podcast doesn’t contain a description of what the subject is, then you have to have a tagline as well that will go after it, so you’re making sure that when people are searching for that subject, then they’re going to find you either on your website or on iTunes. There are ways to incentivise that. You can do things like competitions. You can say that if you can give us an honest review, then I’m going to pick out one review from the last week, and we’re going to send you a free book, or a free microphone, or whatever (whatever’s relevant to your audience). You can run competitions like that. You can just read out reviews as well. You could read out reviews on the show every week. People love getting mentioned. If you read out, then they may be more likely to leave a review for the show because they think they may be read out. That’s some of the biggest ways to get to there. There are other things like running a competition in general actually to get more listeners and encourage sharings. I’ve run competitions before for quite large prizes for my show. Part of the entry requirement has been that the listeners should share the show with their friends, or share it on Twitter, or share it on social media. That could be quite a good way to get your show out there as well. That gets you mentioned in quite a lot of different places. You need to give them some hook, some actual valuable material, a good subject that you’re going to talk about that you can add value to their listeners, because people get a lot of that kind of response. Appearing in a lot of people’s podcasts is a really good way to get yourself out there. Q8. You’ve got a website for your own podcasts, but of course, you don’t actually need a website in order to have your own podcast. You can set it up via iTunes for example as you mentioned. Tell us, why would you recommend that people actually set up a website to go with their podcast? You need a website of some sort. You don’t have to have your own website, but you could set up a space on a podcast hosting website for example. The likely ones are Libsyn or Blubrry. They both allow you to create a space on their own website to host your podcast. That’s a minimum you need, but I do recommend to people that it’s really good to have your own website like you say – to set up your own site, your self-hosted site that hosts your podcast. The reasons for that to me are — the big reason is that if you’re going to start putting some effort into creating something, whether it’s a brand, a brand for a business, whether it’s to promote a business, or whether it’s something that you’re just doing for entertainment, if you’re just actually doing a comedy show or something like that, whatever you’re putting effort into, you want to make sure that you own the space that that brand has been built on, because if you put an effort into it, you want to make sure that you control everything, that it’s completely safe. As unlikely as it is that these other hosting places are going to go out of business, or change their terms, or whatever, it can happen. There have been many cases in the past of podcast hosting companies going out of business and actually just saying, “You have a week to remove your files from our servers,” and they’ll be shut down from then. You have spent time building that space, building up show notes, building up kind of a place for people to come and experience your show, maybe even buy your products; and this place will just close down, so you’ve got nothing. That’s the first thing I think. If you’re going to put effort in something, you should really own the space that that lives on. Some people call it owning the race course, so that when people come to your website, you have complete control over that, and it’s completely safe and sturdy. It’s going to always be around. There’s also just the fact that you can also, then, customise it. You can do a lot of work in customising the site from there. You can put in plug-ins. You can do extra tools. You can do a lot of custom programming. You can do a lot of branding, a lot of design on a site like that that you can’t do on the hosted sites that are a bit more restrictive. Overtime, you can build out that site to be a really good, really valuable, really good-looking, really effective place for people to visit, to find you, and to turn them into loyal listeners, and offer any services you want as well. You may end up selling stuff, via e-commerce or whatever. You can do that on your own site. Q9. You briefly mentioned earlier on that you’ve recently launched your own podcasting course called Podcast Liberation: Set Your Podcast Free. Tell us a bit more about that, how it can help people, what’s included in it. Yes, no worries. That kind of came about because I surveyed all of the readers of the podcast. Well, not all of the readers….. I’ve got a newsletter that people subscribe to on The Podcast Host where I send out weekly podcast resources and tips and tricks for starting a podcast, growing, and monetising, and that kind of stuff. I’ve got about 2,000 or so people on that list. I sent out a survey to that group of really keen sort of podcasters and people looking to start up. One of the biggest problems that people were having actually, it was surprising how many people on that list had been planning their podcast, had been looking to launch something, but just really felt stuck. They just felt trapped. They just felt really unsure as to how to go about launching a show, whether they were doing it the right way. Even people who’d recorded like 5 to 10 test shows and never put anything out there. That’s where the whole idea of the Podcast Liberation came from. It was to set your podcast free as you said. That’s the tagline. Set your podcast free and put it out into the world. All these people had felt they need to start a podcast. In spite of it, they couldn’t set it free. The course goes through three sections. There’s 5 or 6 modules in each section. First section is in planning and strategy. It’s something that I think a lot of people miss out. It’s deciding what the podcast is going to be about, what format you’re going to use. Also all of the real details of the podcast, the aims of the podcast, the personas that you’re targeting, your ideal listener and all that type of stuff. It takes a lot of while to plan out, but it’s really valuable because it’s the kind of thing that keeps you on point and makes sure that you’re creating great content every single time. It also just keeps you going through the hard times when you’ve got that kind of plan. So the first section is designed to actually make sure that you’re creating a podcast that’s going to reach an audience that cares, and it’s going to actually give them some value. The second section is around the equipment and the recording. That takes you through what equipment you need, how to set it all up, from doing remote stuff, just a headset and talking through Skype to another person on the other side of the world and recording that (just like we’re doing just now), or doing in-person interviews. I talk through how to get a recorded and a couple of microphones and record things in coffee shops, or in your office, or in person. There’s a few more things in there as well. Just around actually recording the show and then editing it as well. There’s a whole section on editing, how to put on music and how to do all that kind of stuff. It’s actually not necessarily early on, but you’ll want to do it later on in the show. The final section is publishing. That’s about how to get your podcast artwork, and how to get your podcast music, and how to publish it to iTunes, to Stitcher, to all the different directories that you want to do. Also a brief launch plan as well, a plan for the first 12 weeks or so (4 weeks before launch and then the 8 weeks after launch), how to make sure you’re doing that the right way to get the ball rolling to grow your audience, and a few tactics on how to start growing that audience in the early days as well. So I teach you through basically start to finish, and creating and planning a podcast, creating it, and then getting it out into the world and starting that audience growth. Q10. How is it delivered? Is it via video, audio, or PDFs? We have everything actually. It’s mainly video lessons but with text lessons to go alongside every single one because I know— The one advantage I have I suppose is my online education background. I know how to make a really good online course, and I know that there are so many different learning styles out there. A lot of courses these days are just video, and that actually puts me off a little bit because while I like to do video for the first one round, I like to be able to go back skim through the text – or maybe a subject that I know about better than others, so I like to be able to just read the text and skim through it rather than watch a video. I’ve got video lessons for just about everything. I’ve got text lessons for all them as well. I’ve got some activities, so it’s actually quizzes and text input. You can go through and log your decisions. You can always come back to review it. I’ve got some podcasts as well that go along with it. There’s audio stuff that you can download and listen to on the go. Q11. So it’s not just businesses that can use podcasts. 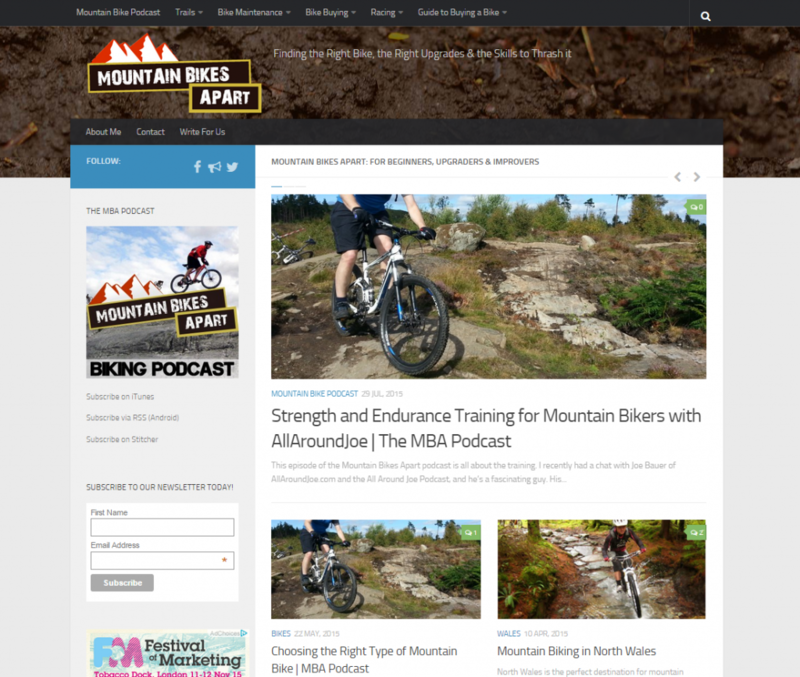 For example, you have a website called Mountain Bikes Apart, and you also have a podcast for that. Tell us about that website and how the podcast has helped it. Yes, sure. That’s always been my kind of—that’s my passion aside from work I suppose: mountain biking. That’s what I do to blow off a bit of steam. I started that website probably seven or eight years ago now, just to write a little bit about my hobby essentially. So it’s always just been a hobby. Of course, since I do podcasting, I thought I’d start a podcast on it too. And yes, it’s been really good actually. The main thing about that podcast is that I don’t make a huge effort to make money out of it or anything like that. I don’t make a huge effort to monetise it. I don’t make a huge effort to promote it either, I have to admit, because it’s about my hobby. Because I’ve planned it quite well, because I deliver the content in a good way, it’s actually grown really well organically. It’s got a really good core of listeners now. It’s in the thousands of listeners, and the benefits that have come from that have been really great – as in I’m sent quite a lot of review items these days. The site makes a fair bit of—not a fair bit of, a good chunk of affiliate income because the podcast tends to draw people in, and it sends them towards the website where they actually read some articles on my reviews of different types of bikes and different types of equipment. They, then buy that equipment based on those reviews, and I get some affiliate income. Also, I’ve been approached for a sponsorship a few times on that as well because the listener numbers are very good and because it’s quite a solid audience. It’s quite a targeted audience. If anybody makes something for mountain bikes, they know that the people that listen to this podcast are really targeted towards that. Even though actually I just started that as a bit of a hobby, that podcast, it has turned into something that could be, if I spend a lot more time on that, it could be made into a business. That’s probably quite a good example for people that do more of a fun and entertaining podcast, that it is still very possible to make money out of these things – if you plan them well, if you put the effort in, if you create good content. Q12. How do you actually promote your websites and drive traffic to them? For example, do you use Facebook, Twitter, YouTube, Periscope, etc. to promote your websites? How successful have they been for you? The big one for me is content marketing. I do just about all of my marketing through pure written and podcast content. So podcasting obviously comes natural. We make podcasts, so PodCraft is the podcast that promotes The Podcast Host. It’s the how-to-podcast podcast. People find me through PodCraft and then are sent towards ThePodcastHost.com from there. That’s how we got a lot of casual readers onto The Podcast Host and onto the products. But also, I write a lot of articles on podcasting equipment, podcast presentations skills, planning podcasting, all that kind of stuff. I write a lot about podcasting, and because of the wealth of stuff on ThePodcastHost.com and the fact that it’s all really focused on podcasting, it means that I get a lot of good, organic traffic through Google. We rank really well for quite a lot of different terms, and that brings in a lot of different traffic that we can then direct towards newsletters, towards products, all that kind of thing. That’s the prime way, and it’s the same for the Mountain Bikes Apart site as well actually. So the podcast and just the written content are really the big lead gens. I have played with social media. I am on social media. I do have pages, Facebook pages, and I use Twitter. I do promote stuff through them, but I have to admit, these days, I spend about less time on them. I use them to engage with my audience, so people get in touch with me that way. I get in touch with them that way. But I don’t do a lot of promotion that way. I find that it’s just—if I’ve got an hour, it’s to do something—I’d rather spend an hour writing content rather than interacting on social media. I find that works better for me. Q13. How do your websites actually make money for you? I suppose I talked about Mountain Bikes Apart. That’s through affiliate income and through sponsorship and also just I’ve been getting stuff, like getting sent review equipment that pays for my biking habit. The Podcast Host is a business site now though. So it actually has a few different services. The courses are for sale obviously, so people buy the courses, and that makes money for the company. We also do a production service. We actually help people with podcasting. The courses are really designed to help those people who want to podcast themselves, those people who want to record, edit, produce, publish themselves; but there are people, many businesses out there that actually want to outsource. They want to record the content. They plan the content, they record it, but then they send us the audio files; and we edit it, we produce it, we process it, and then we publish it for them, including the show notes and that kind of thing too. That’s a service that we offer to businesses out there too. That’s doing really well for us actually because we’re definitely on the premium end of the spectrum. We do everything for them. We offer a lot of advice and mentoring and make sure that it’s done really well – and because of our experience as well, because of my experience in the past and the team that I’ve got as well, we can do a really good job for them and make sure the podcast succeeds. We’re working with some really good companies on that. Also, with The Podcast Host, it gets a little bit of affiliate income from there as well, just through reviewing equipment and that kind of thing. So that’s a nice little sort of steady passive income from microphone recommendations and stuff like that. I mean that’s all just through some honest reviews. We just write about the stuff that we use. I write about all the stuff that I use in an honest way; and I think people appreciate that, the kind of transparency, and they go through to Amazon from there and buy the equipment based on it, and that gets like a really small income. That’s the income streams for The Podcast Host. Q14. What’s it like managing your websites, arranging your podcasts, and running your business? Describe your typical day. [Laughs] Chaotic probably. Yes, as you’ve alluded to there, there’s a lot of stuff going on. Actually, I’m transitioning at the moment. The Podcast Host is growing out this year. At the start of this year, I made a decision to concentrate on The Podcast Host amongst the few things I was doing. It had already been a business before that. I’d been working with people on setting up podcasts, but in the last six months, we’re taking on staff. We’ve taken on new office space. We’re setting up a studio. It’s becoming much more of a company as opposed to just a one-man business like it used to be probably this time last year. I’m doing about less of everything and trying to delegate a bit more. Now I’ve got Matthew McLean, who’s a great audio editor who’s working with me now. He does a lot of the audio production. He manages a lot of the production clients, people we work with to actually produce their podcasts. I’m starting to take on more writers to write some more great content for us so I can concentrate more on new content, new articles, new courses, that kind of thing – this stuff that actually adds more value to the business, and helps listeners and readers as well, and creates more products for us. Q15. What podcasts do you listen to? What are your favourites? I have to admit, I’ve experimented with a lot of podcasts. 5 or 6 years ago I listened to loads of podcasts back then. These days I’m a bit of an addict for entrepreneurial and business podcasts, so I listen to quite a few. I mean you know all the big names like Pat Flynn and Internet Business Mastery, that type of stuff. Actually, in the last month or so, I’ve started to branch out a little bit and try and catch up again on the different types of shows that are out there these days. I’ve come across quite a lot more fictional ones, stuff like—I was just listening to the Black Tapes Podcast, and there’s Aftermath as well from Yap Audio. They’re basically audio dramas. They’re sort of 20-minute, 30-minute episodes. They’re really well-produced. I’m interested because I’m looking to build our audio production capabilities and the different types of audio production we do. There’s obviously the fashion for more shows like those produced by Gimlet which are more storytelling and more highly produced. They take longer to produce, but they sound really good. More like lots of music beds and lots of storytelling, awesome narration, that type of thing. Things like the StartUp Podcast, things like Mystery Show from Gimlet. This American Life obviously as a traditional one. I’ve kind of listened to a lot of different ones in the last few months to make up for the fact that for the two years before that, I was basically just listening to 5 to 10 entrepreneurial shows just trying to build up my kind of digital marketing and business running skills. Things like that. Yes, I’m trying to branch out more now. Q16. What are your plans or goals for the next six months? The next 6 months. 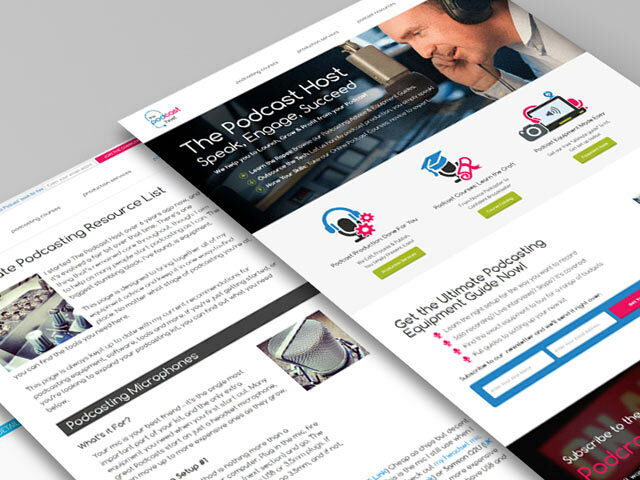 Basically establish The Podcast Host as the premier podcast service in the UK. We’re going to be the only people that only offer a suite of courses to start up podcasting in the UK. We’ll be one of a few that offer production services, but I want us to be the people that you go to for the top-quality service because I think the experience that we have in the team now is going to be enough to guarantee that you’ll get top class service and a really good reassurance that you’ve got a good chance of making a real success and getting a really good listener base. That’s what we want to do. We want to release another couple of courses. We want to release 2 or 3 new shows actually. We’re going to produce a couple of new shows which will be targeted at small businesses in the UK, but also relevant to people in the US or anywhere else in the world too. We’ve got a few plans on how to sort of get ourselves established, and really sort of push that brand a little bit, and get PodCraft, the how-to-podcast built out a bit more too. Build out our team, really sort of get more content creators in and really get ThePodcastHost.com provide even more value than it does just now. Q17. Well, Colin, thank you very much for joining us at the Easyspace.com blog. Just to finish off, can you tell us how people can find out more about you? Where should they go online, Twitter, etc. if they want to find out more about you and get in touch with you? No problem at all. The website is ThePodcastHost.com. That’s where you’ll find all our services, and all the free articles and everything. So also, you can also come along and have a read about podcasting if you haven’t find it before. Social, I’d love to hear from you on Twitter @ThePodcastHost. You can find us on Facebook as well. I think it’s just Facebook.com/thepodcasthost. We’re basically ThePodcastHost just about anywhere, so you’ll find us easy enough. Well, thank you very much, Colin. Thanks. Thanks for having me. It’s been great. Has Colin inspired you to start your own business? Maybe he has encouraged you to set up your own website? If he has, then begin by searching for the domain name you want, then get some web hosting. A great way to quickly get your own website is to use WordPress – it is easy to setup, manage and update – and best of all you’ll have a great looking website too.